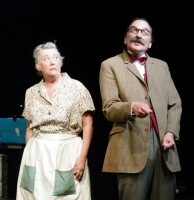 Gill's appearances for Bawds include A MURDER IS ANNOUNCED (Bunny), UNDER MILK WOOD (pictured above as Narrator / Woman) and MURDER IN THE CATHEDRAL (Odilla). 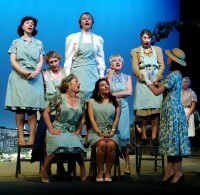 Appearances for other companies include HABEAS CORPUS (Lady Rumpers), HENRY V (Chorus) and A WINTER'S TALE (Chorus). 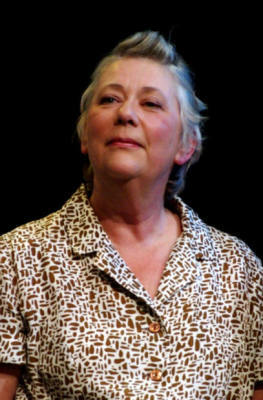 Gill has also appeared in a number of one-act festival plays and pantomimes and several productions including SWEENEY TODD, BREATH OF SPRING, KEY FOR TWO, ABIGAIL'S PARTY, BLITHE SPIRIT, SEPARATE TABLES, TABLE MANNERS, ABSURD PERSON SINGULAR, CIDER WITH ROSIE, WAITING IN THE WINGS, RELATIVELY SPEAKING, THERE GOES THE BRIDE, NATURAL CAUSES and HARRY SIMPSON, WHERE ARE YOU? (Mary). 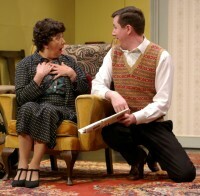 Directing experience includes HUMBLE BOY.